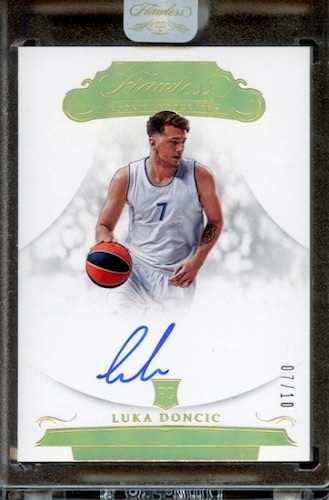 It really didn't take all that long for Luka Doncic rookie cards to explode in value and collecting interest. While it is impossible to predict how the rest of his career will go, Doncic's rookie season is already one of the very best in recent memory. Just 19 when his NBA career began with the Dallas Mavericks, Luka Doncic has taken both the league and hobby world by storm. His play on the court has made him the frontrunner for 2018-19 NBA Rookie of the Year. He already has the Rookie of the Month awards from November, December and January. 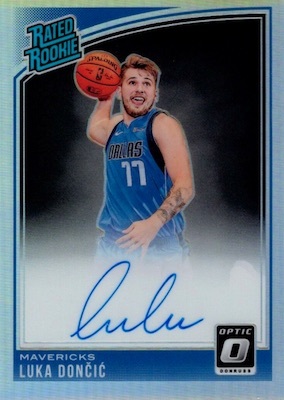 View high-end Luka Doncic cards on eBay. For collectors, most of the focus is on his 2018-19 basketball sets from Panini. New options are issued throughout the season and it is safe to expect a large number of Luka Doncic rookie cards to pick between. 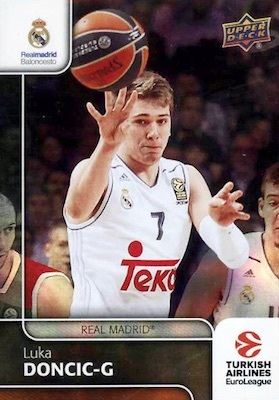 However, the initial Luka Doncic cards came from his EuroLeague days with Real Madrid. The key pre-rookie cards for Doncic are covered at the bottom of the list below. There are also sections for his top base rookies, inserts and autographs. 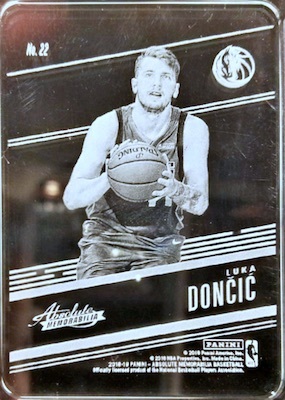 In addition to what is detailed in the Luka Doncic rookie card guide, review our real-time hot list to see exactly which of Doncic's card auctions are receiving the most attention on eBay. Those searching for Luka Doncic autographed memorabilia can check out Fanatics, which holds the exclusive. Bolded sets go directly to detailed product profiles and checklists. Purchase cards or check values on eBay using the specific links. 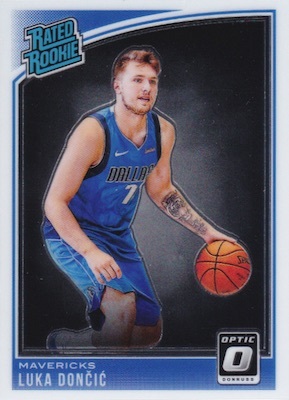 Like many of the chromium sets, 2018-19 Donruss Optic offers a base Luka Doncic rookie card and many parallels. This gives collectors options and several different price points to work with. The Rated Rookie line also carries a strong history, which boosts its budget appeal. Check out the Premium Box Set for a more valuable edition numbered to 249. What 2018-19 Prizm NBA lacks in rarity, it makes up for in brand popularity. 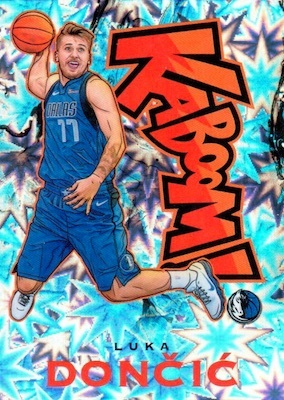 This is the base Doncic rookie card to own. Prizm has an even larger parallel rainbow than Optic, including many exclusives, and some staggering prices associated with the rarest versions. In fact, many of these unsigned parallel cards have sold for over $1,000. 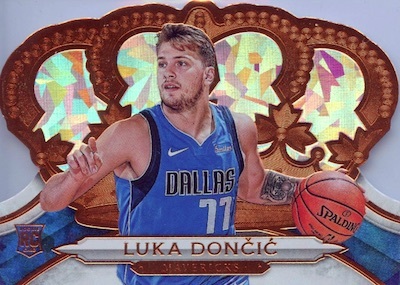 While base Luka Doncic rookies come in many versions, 2018-19 Crown Royale offers one of the most distinct. The signature die-cut design really stands out, and the Crystal editions, like the one below, add a little extra pop. Another unique choice is the metal base rookie in 2018-19 Dominion NBA. Admittedly, the protective cover notation could use a little finesse, but the rounded card offers rarity of 199 copies and a much sturdier stock than cardboard. For the unsigned inserts, we skew even more to the rare and unique. 2018-19 Absolute delivers on both counts in the Glass insert. Issued as a redemption card, the exact rarity is unknown but these are very tough pulls and the live versions are quite stunning. Bringing a comic book element to the game, the Kaboom! 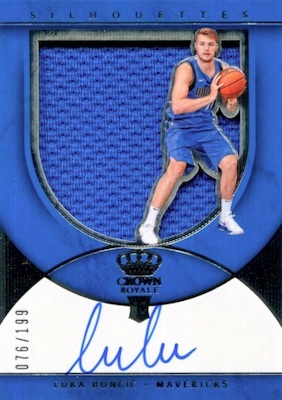 inserts for Doncic in 2018-19 Crown Royale are anything but subtle. They are also rarely surface. While the cartoon-styled image for Luka looks a bit goofy because of his facial expression, these bold cards command big bucks. 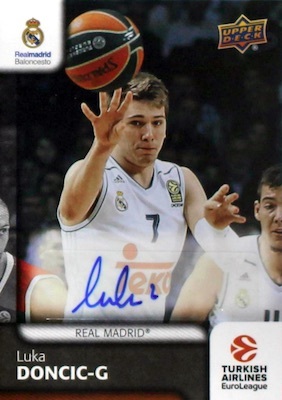 Given his early success, any Luka Doncic rookie autograph is going to enjoy tremendous interest. However, a few stand out above the rest. Taking the Rated Rookie design from 2018-19 Donruss Optic and adding an on-card signature, collectors may notice this is the same image used for the Kaboom! insert. Once again, parallels see the highest values. It may still be well below the football set's popularity, but 2018-19 Contenders NBA is a good reminder that the basketball set continues to increase its hobby profile. 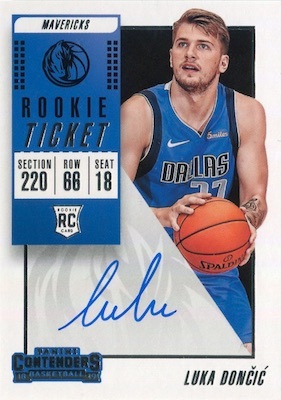 The hard-signed Rookie Ticket subset is home to a main Luka Doncic rookie card and a limited image variation. 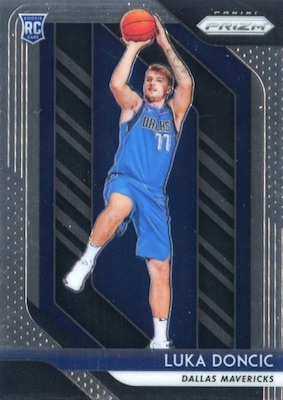 The base card features a black silhouette logo for the Mavericks while the variation opts for color. 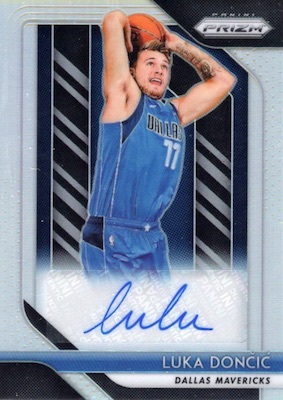 As the first major release of the '18-19 collecting season, 2018-19 Contenders Draft Picks features the earliest pack-pulled Luka Doncic autograph with the RC logo. In spite of the airbrushed image and sticker autograph, the International Ticket card is a key option for collectors. 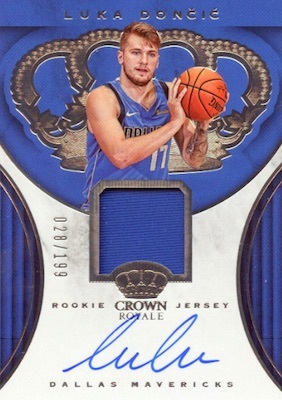 Adding to a product that already includes the die-cut base rookie and Kaboom insert for Doncic, 2018-19 Crown Royale also contains a hard-signed RPA. The Rookie Silhouettes card is capped at 199 copies and incorporates a large jersey swatch. There is also a Rookie Jersey Autograph card in the set with the same print run. 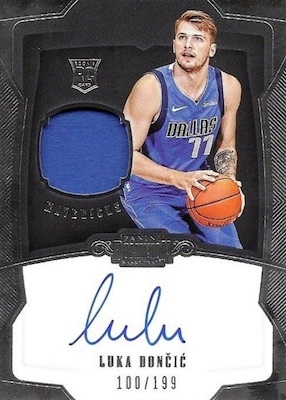 Although it is just one of several on-card autographs for Doncic, 2018-19 Dominion NBA features the earliest rookie patch autograph edition that is hard-signed. Rarity again sits at 199 copies. Like Contenders Draft Picks, 2018-19 Flawless Collegiate works with a generic image. 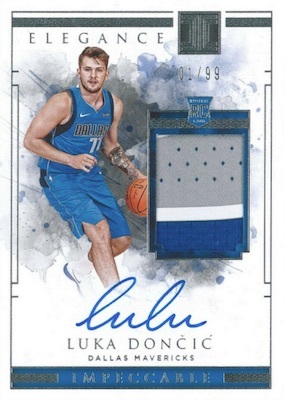 Still, the high-end product features one of the rarest Luka Doncic rookie cards and a price tag that is out of reach for most collectors. As the first truly high-end NBA release of the year, the 2018-19 Impeccable rookie for Doncic is impressive. This Elegance RPA is signed on the card and limited to 99 copies. Doncic also has a metal Stainless Stars insert and autograph (#/99), a Gold (#/10) and Silver NBA Logo card (#/22) with a half-ounce of gold or one ounce of silver, and an on-card Impeccable Rookies Signatures card (#/99). 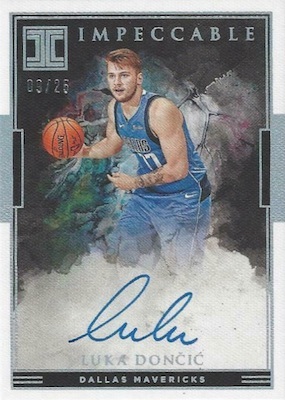 As one of the best-selling autographs for Doncic, collectors don't seem to mind the sticker signatures in 2018-19 Prizm NBA. In fact, the low-numbered parallels, of which there are many, have seen some insane prices. The Doncic NBA rookie cards are the clear favorite, but those who prefer the earliest options should check out 2016-17 UD EuroLeague. 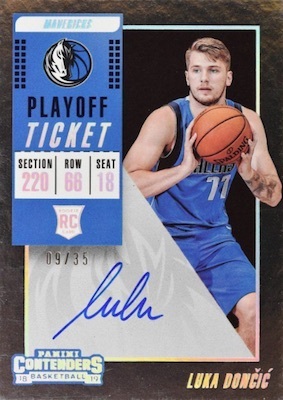 Issued only through Upper Deck's online ePack platform, there are physical Rainbow versions that can be redeemed by combining 10 of the digital base cards for Doncic. Made available over a year later in October 2018, a rare autographed version adds a sticker signature. Luka Doncic 2018-19 Revolution Cosmic 78 100 BGS 10 3X10 Pristine !! 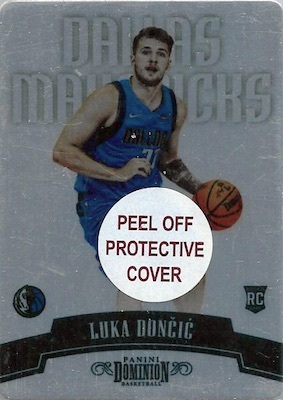 2018-19 Rare #9 15 Luka Doncic Retro Custom Rookie Card Dallas Mavericks Mint! Luka Doncic 2018-19 Revolution On Card Auto BGS 9.5 10 1X10 !!!! 2018-19 Panini Impeccable Basketball Stainless Stars Luka Doncic Auto 99! !